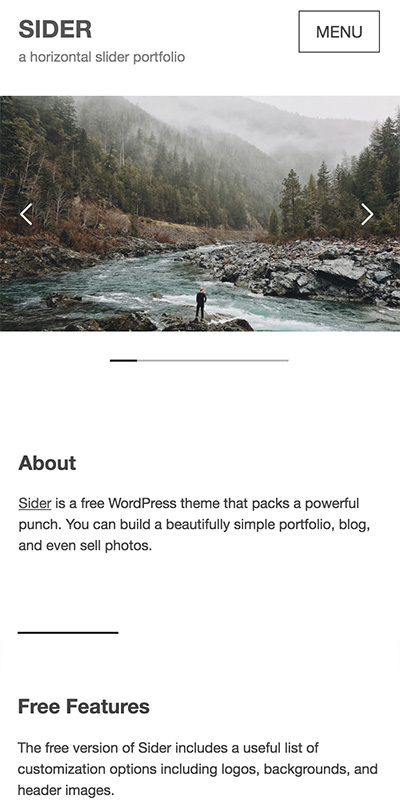 Sider is a horizontally-scrolling WordPress theme that you can use to showcase and sell your photos and artwork online. Includes support for JetPack's Portfolio post type module. Includes support for Sell Media, WooCommerce, and Easy Digital Downloads. Add beautiful lightbox galleries to any post, page, or portfolio. Insert featured content sliders in the header area of your site. Optionally enable a responsive mega menu in your site nagivation. Includes various styles from modern to elegant to colorful to dark. Choose from hundreds of available Google fonts for your site. Change or remove the footer credit in one click.